Today sees the UK’s biggest strike in decades as public sector workers protest against pension reforms. Most news organisations are covering the day’s events through liveblogs: that web-native format which has so quickly become the automatic choice for covering rolling news. To illustrate just how dominant the liveblog has become take a look at the BBC, Channel 4 News, The Guardian’s ‘Strikesblog‘ or The Telegraph. The Independent’s coverage is hosted on their own live.independent.co.uk subdomain while Sky have embedded their liveblog in other articles. There’s even a separate Storify liveblog for The Guardian’s Local Government section, and on Radio 5 Live you can find an example of radio reporters liveblogging. The format has become so dominant so quickly because it satisfies both editorial and commercial demands: liveblogs are sticky – people stick around on them much longer than on traditional articles, in the same way that they tend to leave the streams of information from Twitter or Facebook on in the background of their phone, tablet or PC – or indeed, the way that they leave on 24 hour television when there are big events. It also allows print outlets to compete in the 24-hour environment of rolling news. 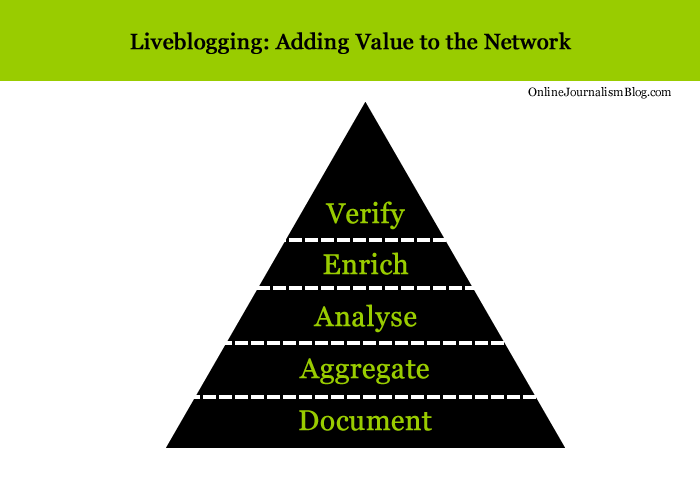 The updates of the liveblog are equivalent to the ‘time-filling’ of 24-hour television, with this key difference: that updates no longer come from a handful of strategically-placed reporters, but rather (when done well) hundreds of eyewitnesses, stakeholders, experts, campaigners, reporters from other news outlets, and other participants. 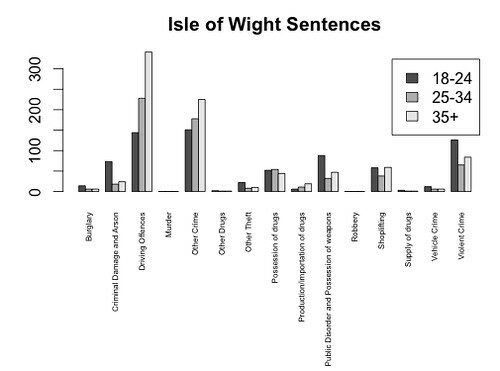 The results (when done badly) can be more noise than signal – incoherent, disconnected, fragmented. When done well, however, a good liveblog can draw clarity out of confusion, chase rumours down to facts, and draw multiple threads into something resembling a canvas. At this early stage liveblogging is still a form finding its feet. More static than broadcast, it does not require the same cycle of repetition; more dynamic than print, it does, however, demand regular summarising. Most importantly, it takes place within a network. The audience are not sat on their couches watching a single piece of coverage; they may be clicking between a dozen different sources; they may be present at the event itself; they may have friends or family there, sending them updates from their phone. If they are hearing about something important that you’re not addressing, you have a problem. 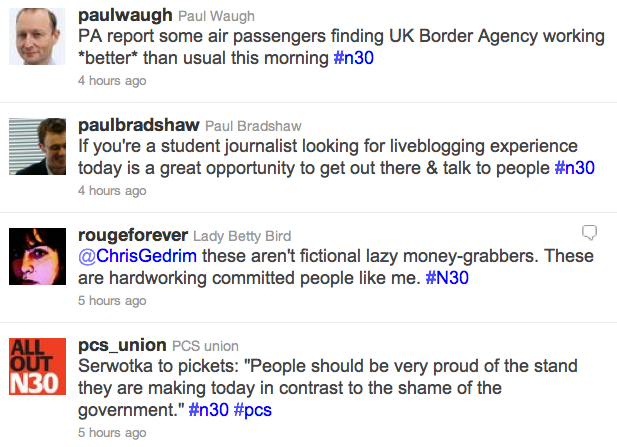 The list of liveblogs above demonstrates this particularly well, and it doesn’t include the biggest liveblog of all: the #n30 thread on Twitter (and as Facebook users we might also be consuming a liveblog of sorts of our friends’ updates). In this situation the journalist is needed less to document what is taking place, and more to build on the documentation that is already being done: by witnesses, and by other journalists. That might mean aggregating the most important updates, or providing analysis of what they mean. It might mean enriching content by adding audio, video, maps or photography. Most importantly, it may mean verifying accounts that hold particular significance. These were the lessons that I sought to teach my class last week when I reconstructed an event in the class and asked them to liveblog it (more in a future blog post). Without any briefing, they made predictable (and planned) mistakes: they thought they were there purely to document the event. But now, more than ever, journalists are not there solely to document. On a day like today you do not need to be journalist to take part in the ‘liveblog’ of #n20. If you are passionate about current events, if you are curious about news, you can be out there getting experience in dealing with those events – not just reporting them, but speaking to the people involved, recording images and audio to enrich what is in front of you, creating maps and galleries and Storify threads to aggregate the most illuminating accounts. Seeking reaction and verification to the most challenging ones. The story is already being told by hundreds of people, some better than others. It’s a chance to create good journalism, and be better at it. I hope every aspiring journalist takes it, and the next chance, and the next one. This entry was posted in blogging, twitter and tagged BBC, channel news, chronicle, essex county standard, Guardian, huffington post, Independent, liveblogging, n30, pensions justice, Sky, storify, Telegraph, uk uncut, unison on November 30, 2011 by Paul Bradshaw. There’s a fascinating case study going on across some skeptics blogs on dealing with legal threats from another country. The Quackometer and Rhys Morgan have – among others – received emails from Marc Stephens, who claims to “represent” the Burzynski Clinic in Houston, Texas, and threatens them with legal action for libel, among other things. There’s plenty more in each post, including reference to case law and the pre-action defamation protocol, which provide plenty of material if you’re ever in a similar situation – or hosting a classroom discussion on libel law. This entry was posted in blogging, regulation and tagged Burzynski Clinic, libel, marc stephens, Quackometer, rhys morgan on November 29, 2011 by Paul Bradshaw. 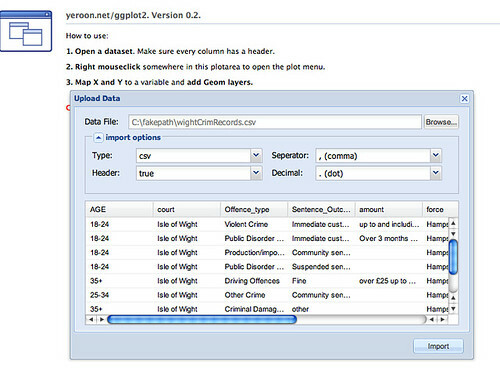 – the URL of the sentencing data is http://www.justice.gov.uk/downloads/publications/statistics-and-data/criminal-justice-stats/recordlevel.zip, which does not contain a time reference, although the data is time bound. 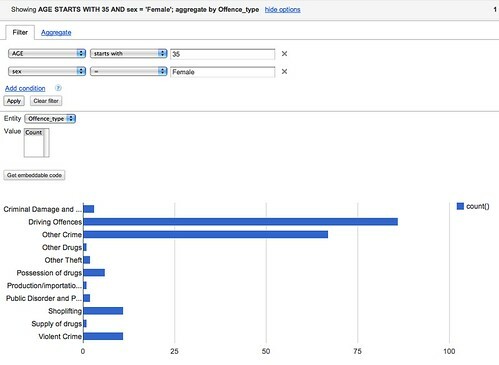 What URL will be used if data for the period 7/11-6/12 is released in the same way next year? The data is presented as a zipped CSV file, 5.4MB in the zipped form, and 134.1MB in the unzipped form. I’m on a Mac, so like Linux users I have ready access to a Console and several common unix commandline tools that are ideally suited to wrangling text files (on Windows, I suspect you need to install something like Cygwin; a search for windows unix utilities should turn up other alternatives too). 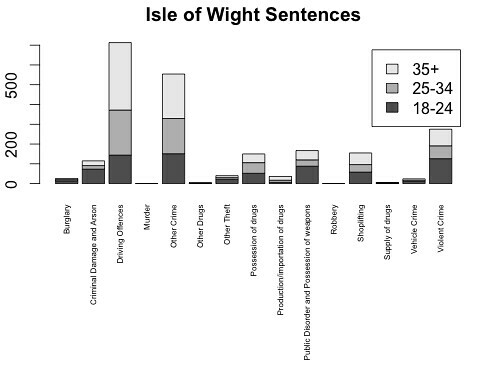 Having extracted rows that contain a reference to the Isle of Wight into a new file, I can upload this smaller file to a Google Spreadsheet, or as Google Fusion Table such as this one: Isle of Wight Sentencing Fusion table. 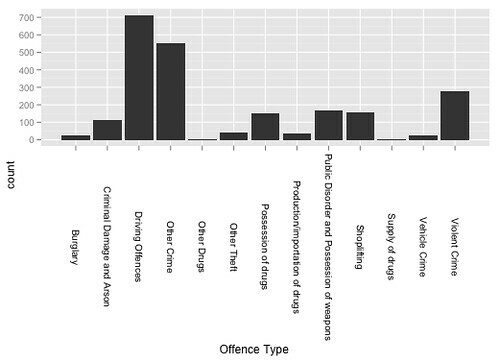 Looking at data from a single court may be of passing local interest, but the real data journalism is more likely to be focussed around finding mismatches between sentencing behaviour across different courts. 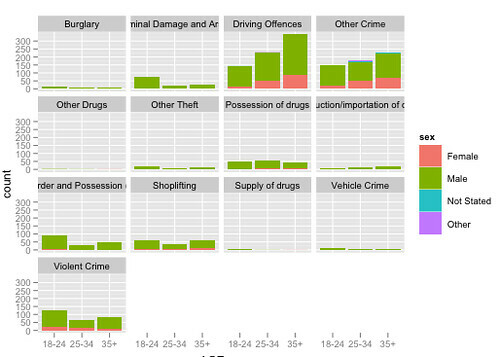 (Hmm, unless we can get data on who passed sentences at a local level, and look to see if there are differences there?) 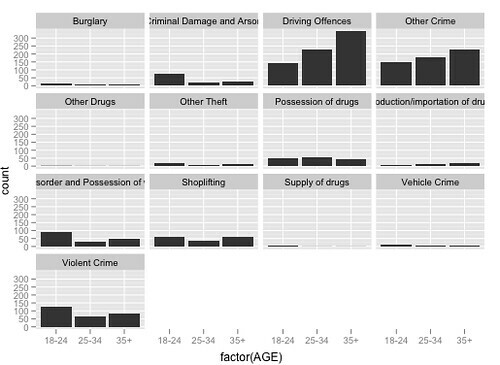 That said, at a local level we could try to look for outliers maybe? As far as making comparisons go, we do have Court and Force columns, so it would be possible to compare Force against force and within a Force area, Court with Court? 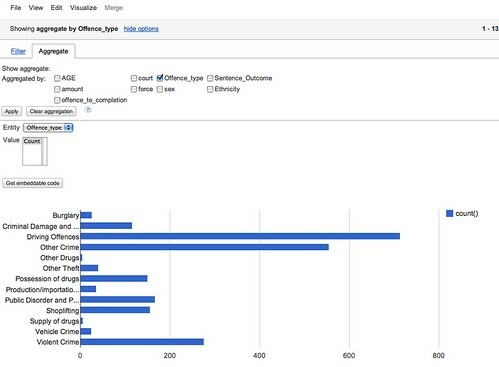 If you really want to start working the data, then R may be the way to go… I use RStudio to work with R, so it’s a simple matter to just import the whole of the reportlevel.csv dataset. We can also start to look at combinations of factors. 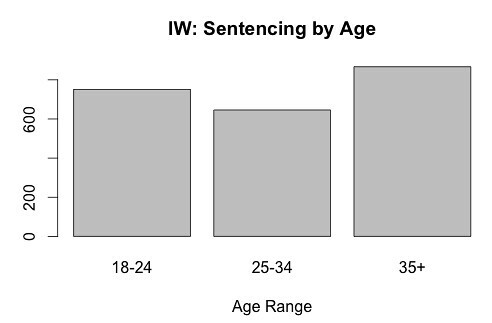 For example, how do offence types vary with age? 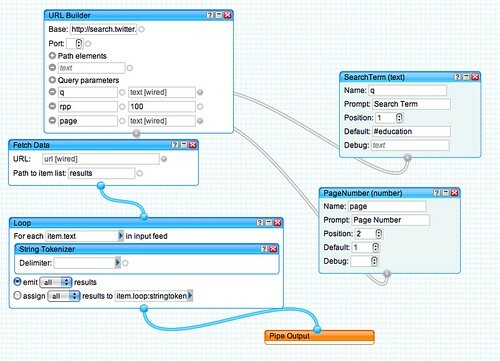 This entry was posted in online journalism and tagged data, DDJ, onlinejournalismblog, opendata, policy, Rstats, Uncourse, ventnorblog on November 29, 2011 by Paul Bradshaw. I’ve dabbled in this area before, though not addressing this question exactly, using Yahoo Pipes to find what hashtags are being used around a particular search term (Searching for Twitter Hashtags and Finding Hashtag Communities) or by members of a particular list (What’s Happening Now: Hashtags on Twitter Lists; that post also links to a pipe that identifies names of people tweeting around a particular search term.). So what would we need a pipe to do that finds terms surrounding a twitter hashtag? Firstly, we need to search on the tag to pull back a list of tweets containing that tag. Then we need to split the tweets into atomic elements (i.e. separate words). At this point, it might be useful to count how many times each one occurs, and display the most popular. We might also need to generate a “stop list” containing common words we aren’t really interested in (for example, the or and. So here’s a quick hack at a pipe that does just that (Popular words round a hashtag). We can now use the helper pipe in another pipe. Firstly, let’s grab the words from a search that returns 200 tweets on the same search term. The helper pipe is called twice, once for the first page of results, once for the second page of results. The wordlists from each search query are then merged by the union block. 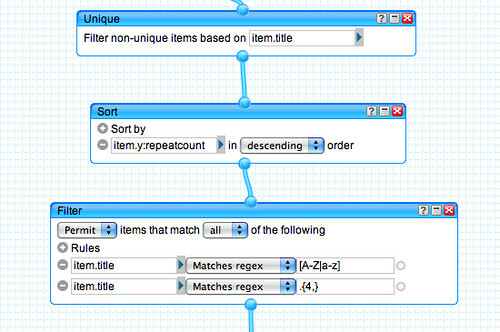 The Rename block relabels the .content attribute as the .title attribute of each feed item. The next thing we’re going to do is identify and count the unique words in the combined wordlist using the Unique block, and then sort the list accord to the number of times each word occurs. I also added a user input that allows additional stop terms to be added (they should be pipe (|) separated, with no spaces between them). You can find the pipe here. This entry was posted in online journalism and tagged onlinejournalismblog, Tinkering on November 22, 2011 by Paul Bradshaw.